VANCOUVER—Ten million dollars set aside by the Harper government to address the crisis of missing or murdered Aboriginal women will be redirected to the Department of Justice and the Ministry of Public Safety. And that has some groups, like Vancouver's Walk 4 Justice, fuming. “We have the answers and tools already because we’ve been working on this issue for a long time,” said Gladys Radek, a co-founder of the Indigenous-led campaign. Radek was jolted into action when her niece, Tamara Chipman, disappeared in 2005 along Highway 16 in northern British Columbia. She has since organized three walks—the first a 4,000-kilometre march from Vancouver to Ottawa in the summer of 2008—to press the federal government to initiate a public inquiry and deal with the root causes of violence against Indigenous women. Eight months after the 2010 budget release of promised funding, Minister for Status of Women Rona Ambrose announced the money will be spent on seven different initiatives, the bulk on a national police support center for missing persons. The Native Women’s Association of Canada (NWAC) quickly expressed their alarm. “While NWAC is supportive in principle to see the Government of Canada taking steps to address the issue of missing and murdered Aboriginal women, we must undoubtedly express our disappointment with the exclusion of Sisters In Spirit in the ongoing development of public policy in the matter,” they stated in a release. The Conservatives kept Sisters in Spirit—NWAC’s research, education and policy initiative that deals with missing and murdered Aboriginal women—in limbo for eight months, and then gave NWAC only a day’s notice before the announcement was finally made. 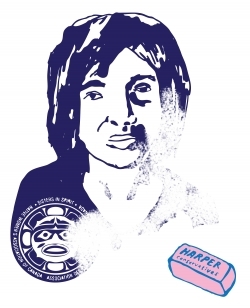 Status of Women officials made clear to NWAC that any new funding proposals would not permit the use of the Sisters in Spirit name or the continuation of their groundbreaking and growing database. Since 2005, Sisters in Spirit has been gathering complex statistical information on violence against Aboriginal women. It has shown that more than 582 Aboriginal women have gone missing or been murdered in Canada since roughly 1980. Twenty of the cases have occurred in the past year, and 226 in the past 10 years. Such information was previously scattered and highly deficient. Liberal MP and Official Opposition Critic for Status of Women, Anita Neville believes the Conservative government’s move was deceptive. Despite Harper’s stated commitment to “take concrete steps to address the issue of missing or murdered Aboriginal women,” the details in the announcement are not specific to Aboriginal women. Instead, the largest portion of the funding will be spent on a generic RCMP missing-persons database and amendments to the criminal code to allow more police freedom around warrants and wire-taps. A much smaller fraction of the funds will go toward what many see as the most critical work: victim, family and healing support, and dealing with the root causes of violence. NDP Aboriginal Affairs critic Jean Crowder agrees with Ashton. Opposition critics have also accused the Conservatives of pushing through pieces of their tough-on-crime agenda under the cover of this national strategy. According to the Department of Justice website, the seven initiatives include amendments that would “streamline” the process for securing authorization for wire-taps, potentially avoiding court orders or judge-issued warrants. While the government claims the change is linked to potential investigations involving Aboriginal women, the initiative is actually a recycled portion of Bill C-31, allowing warrant-less wiretapping. The bill died last year when Harper prorogued Parliament. Canada’s lack of consultation, transparency and relationship-building in this instance illustrates a glaring pattern concerning the Conservatives' policies toward Indigenous Peoples. Upon taking power in 2006, the Stephen Harper government canceled the Kelowna Accord—a $5.1 billion strategy to improve Aboriginal health and water services, housing, and education. This, despite the reality that over a third of First Nations children live in overcrowded homes, and one in three First Nations people consider their main source of water unsafe to drink. This move was the first in a series of cuts Harper would make to Aboriginal communities despite the optics of attempted reconciliation with First Peoples. In 2007, Canada was one of only four countries to vote against the United Nations Declaration on the Rights of Indigenous Peoples. In spite of a recent endorsement, some Aboriginal leaders believe Canada’s signature does not reflect a desire to honor Aboriginal people or their rights, but rather a need for good public relations. And just two years after Harper’s apology to Aboriginal people for the residential school project and its legacy, the Conservatives cut funding to the Aboriginal Healing Foundation (AHF). The decision meant the end of significant funding to a Canada-wide network of 134 community-based healing initiatives addressing intergenerational trauma resulting from the schools. The recent announcement by Minister Ambrose indicates that $4.65 million will go towards community and school-based programs to deal with cycles of violence and improve the safety of Aboriginal women in Aboriginal communities. “While this focus on violence within Aboriginal communities is important, I think given the statistics we have seen, we also need to look beyond Aboriginal communities, at, for example, non-Aboriginal perpetrators who commit murder and acts of violence against Aboriginal women, like Robert Pickton,” Crowder said. According to Amnesty International, Aboriginal women are almost three times more likely than non-Aboriginal women to be killed by a stranger. In addition, 60 per cent of women and girls were killed in urban areas, 28 per cent in rural areas, and 13 per cent on-reserve. There is also recognition within the Aboriginal community and among advocates that those in positions of power in Canadian society, in particular police and justice system officials, have themselves been accused and charged as perpetrators of violence against Aboriginal women. Some view this as key to understanding Aboriginal women’s lack of trust in the justice system and their confidence in police protecting them from violence. Last month former Attorney General Wally Oppal was hired to look into police investigations of the disappearances and murders of women, many of them Aboriginal, from Vancouver's Downtown Eastside and why serial killer Robert Pickton was not charged after an incident in 1997. Shawn Atleo, National Chief of the Assembly of First Nations (AFN) and Ernie Crey, whose sister’s DNA was found on the Pickton farm, issued a statement in October 2010, expressing their views about the Canadian justice system. With such mistrust in Canada’s justice system amongst First Nations leaders, advocates and Aboriginal women's groups, why is the Department of Justice now spearheading a campaign to end violence against Aboriginal women? “Many of the family members are now thinking of reporting crimes less because they feel it won’t do anything anyways,” said Gladys Radek. Regardless of the funding allocation, NWAC has made a commitment to the families to continue to hold annual family meetings, work with families to share stories, convene community workshops and develop tools and resources. Meanwhile, Radek’s group Walk 4 Justice continues their work—spreading awareness, working with family members and communities to advocate for missing and murdered women, and urging the public to take action—with no government funding. Angela Sterritt is a writer, artist and broadcast journalist based out of Vancouver, BC. She is from the Gitxsan Nation. Submitted by flit (not verified) on Tue, 2010-12-14 20:35. Very glad to see this article. This issue needs way more attention than it is getting. Submitted by Anonymous (not verified) on Sat, 2011-01-15 23:59. 'Eddie John sponsors drug trafficking on northern reserves using Treaty Commission and Indian Affairs money. He’s the power up there. The only way for multinational corporations to make land deals is through him. But for Ed John to keep power he needs to manipulate drugs and the cops. He’s forced our family to surrender their trap lines to his family so that he could log off the land for his own timber company. Ed John even arranged to have my wife Helen’s cousin suffocated to get his trap line. When Helen and I complained about it, and about Ed John taking away our housing and giving it to his own relatives, at his Tribal Council meeting in Prince George in 1994, his private goon squad roughed us up. Eight of them surrounded our car and started beating us up. Cops like Jack Lasert of the RCMP just looked the other way and wouldn’t let us press charges.They were all working for Ed John.